August 24, 2015 – “What is worse? 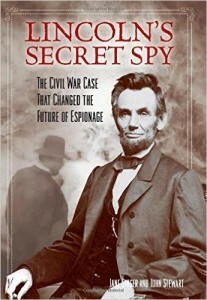 A confederate con man claiming he was Lincoln’s spy throughout the Civil War, or the Union veteran who pursed his claim all the way to the Supreme Court?” That’s the central question of Jane Singer’s book, Lincoln’s Secret Spy: The Civil War Case that Changed the Future of Espionage . In it, she introduces us to William Alvin Lloyd. Con man, bigamist, charlatan, Lloyd hobbled out of the defeated Confederacy and into the capital of the newly re-United States with a claim that made people listen: The government owed him money for serving as Abraham Lincoln’s covert operative. John Wilkes Booth had shot down the Great Emancipator just a month earlier in April 1865, and couldn’t refute the story. So, armed with Lincoln’s signature on a travel pass and a skill for duping people — including no less than Secretary of War Edwin Stanton, who was at the president’s side when he died — Lloyd teamed up with lawyer Enoch Totten, who’d served in the Union Army during the conflict. The story of their conspiracy to defraud the American people is brought to us by my guest, Jane Singer, and her co-author, John Stewart. Jane is a Civil War scholar and author of The Confederate Dirty War: Arson, Bombings, Assassination and Plots for Chemical and Germ Attacks on the Union , the basis of the History Channel special, Civil War Terror. You can follower her at Facebook.com/JaneSingerAuthor or @JaneBSinger1 on Twitter. Her book is more than a tale of a long-ago fraud. The Supreme Court’s ruling in Totten v. United States is a legal precedent that affects our clandestine operatives to this day. Here’s my conversation with Jane about this intricate tale of espionage and lies.